Parts coming in contact with Bottle / Screw cap / exposed to the atmosphere are made out of AISI 304. A Safety clutch devices are integrated at bottle feeding worm & Star wheel system for stoppage of machine in the event of jamming on machine. Inventive Magnetic hysterias Screw capping head with mechanically torque adjustment facility. All Electrical Accessories, Gear box and motor are of CE Certified. Pick and Place Screw capping machine is a compact model used for sealing of Screw type of cap on the bottle which works on Pick and Place type mechanism. 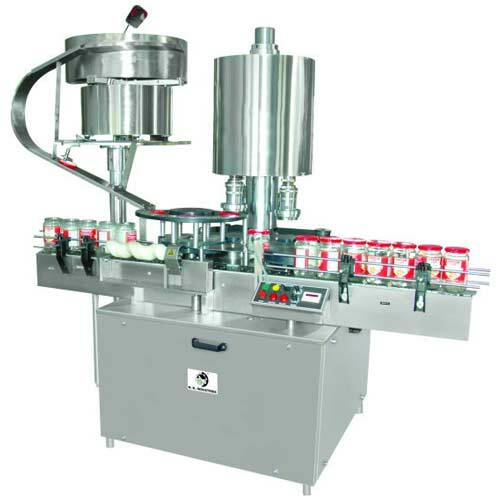 Previously filled bottles are continuously fed from upstream machine to flat conveyor belt of sealing machine and move further through in feed worm for correct spacing between two bottles and transferred to the in feed star wheel. Screw caps kept in orientation unit automatically orient caps in right direction before entering into delivery chute. Meanwhile Cap will be picking by Rotating Jaw type capping head. After that Jaw type capping head will do screwing on bottle and ensure perfect sealing of bottle.